Anaheim Automation, Inc. offers a line of quality Stepper Motors with Planetary Gearboxes. This gearmotor product line incorporates a High-Torque Stepper Motor with an economical Planetary Gearbox, making this series an exceptional value! Available in NEMA sizes 11, 17 and 23, and a wide range of gear ratios ranging from 3.7 to 720:1 (depending on the stepper motor selected). 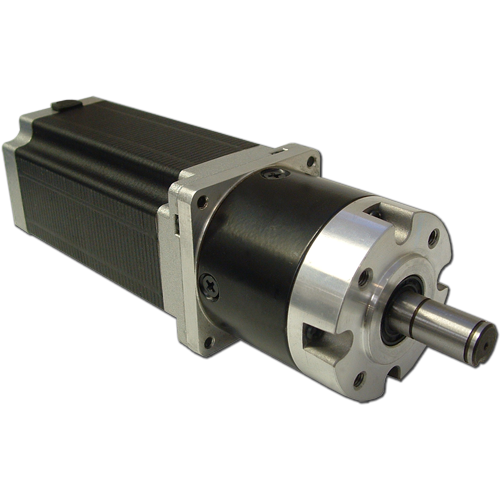 These gearmotors are ideal for applications that require high torque in a small package. These planetary gearmotors can be customized to perfectly match voltage, current, and maximum operating speed specification, for maximum design flexibility. The stepper motor/planetary gearmotors come in 3 to 5 motor lengths (depending on frame size), making this a cost-effective option for many high torque requirements. The 11YPG Series incorporates a NEMA 11 High-Torque Stepper Motor with an economical Planetary Gearbox. The CE Certified 11YPG Series is offered in fourteen gear ratios ranging from 3.7:1 to 720:1, and is capable of up to 2116-ounce inches of bipolar torque (depending upon the gear ratio chosen). The 11YPG series has a 12 inch, four-lead wire configuration as standard, however, customization is available for larger quantities. The 17YPG Series incorporates a NEMA 17 High-Torque Stepper Motor with an economical Planetary Gearbox. The CE Certified 17YSG Series is offered in fourteen gear ratios ranging from 3.7:1 to 720:1, and is capable of up to 1,250-ounce inches of bipolar torque (depending upon the gear ratio chosen). The 17YPG series has a 12 inch, four-lead wire configuration as standard, however, customization is available for larger quantities. The 23YPG Series incorporates a NEMA 23 High-Torque Stepper Motor with an economical Planetary Gearbox. The CE Certified 23YPG Series is offered in fourteen gear ratios ranging from 3.6:1 to 326:1, and is capable of up to 6,250-ounce inches of bipolar torque (depending upon the gear ratio chosen). The 23YPG series has a 12 inch, eight-lead wire configuration as standard, however, customization is available for larger quantities. The 24YPG Series incorporates a NEMA 24 High-Torque Stepper Motor with an economical Planetary Gearbox. The CE Certified 24YPG Series is offered in fourteen gear ratios ranging from 3.6:1 to 121:1, and is capable of up to 3,334-ounce inches of bipolar torque (depending upon the gear ratio chosen). The 24YPG series has a 12 inch, eight-lead wire configuration as standard, however, customization is available for larger quantities.